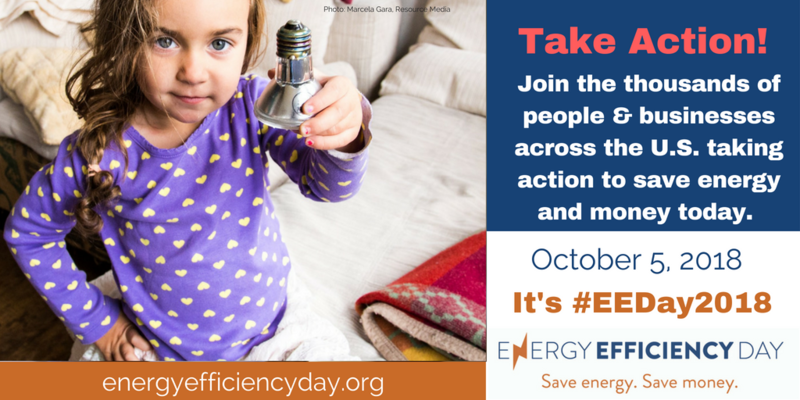 On October 5, 2018 a growing network of advocates, companies, government agencies, utilities and others will showcase the benefits of efficiency during the third annual Energy Efficiency Day. What can you do for Energy Efficiency Day? Make the Switch to LEDs – Replace 5-10 incandescent bulbs at home or at the office. Use a power strip for electronics – Unplug it or turn it off when devices are not in use. At your business, provide power strips or automatic shut-down options. For more information, contact: info@energyefficiencyday.org. Visit www.energyefficiencyday.org to learn more and to download a social media toolkit.